This post is one in a series about Pattaya tourist attractions to which I will add to over the next few months. Other posts in this series which might interest you include Khao Kheow Zoo, a short ride away but one of the better tourist attractions in the Pattaya area. Discover the tropical gardens of Nong Nooch Pattaya. See the world in miniature at Mini Siam Pattaya. 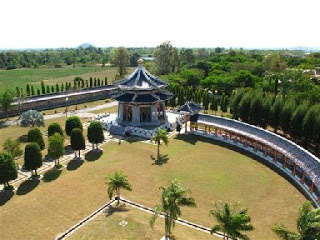 Built in honour of their father ‘Kiarti Srifuengfung’ by his 6 children, the Three Kingdoms Park in Pattaya is a monument to Thai and Chinese culture, and the Chinese epic novel ‘The Three Kingdoms’. Inside the park there are 3 pagodas, the main one of which has 4 floors, from the fourth floor you get a magnificent view of the park, a strong breeze also cools you down at the same time. The three Kingdoms park also includes the longest corridor of hand painted tiles in the world, the purpose of which is to tell the story of the three kingdoms. It won’t take you long to walk around the park, 2- 3 hours is probably enough. 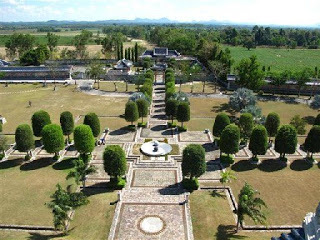 The 3 Kingdoms Park is one one of the lesser known Pattaya tourist attractions and was very quiet when we visited. 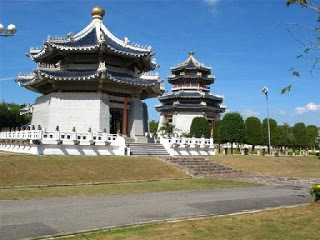 The 3 Kingdoms park is laid out in the Chinese Feng Shui style and covers an area of 36 rai. Well maintained and highly decorative, it is also very photogenic so don’t forget your camera. 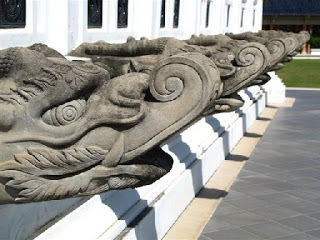 The architecture at Pattaya’s Three Kingdoms Park offers some great photo opportunities. 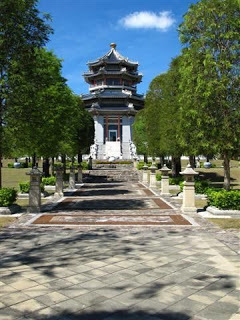 Photo above: One of the three pagodas at 3 Kingdoms Park in Pattaya. 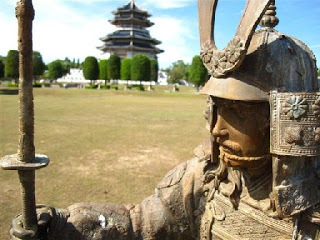 photo above: An ancient Chinese warrior stands guard in the gardens of Three kingdoms Park. Photo above: One of the 2 smaller pagodas with the main pagoda in the background. Photo above: Looking out from the fourth floor of the main pagoda at Three Kingdoms Park. Another view from Three Kingdoms Park. 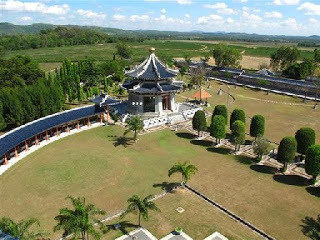 Photo above: The Three Kingdoms Park is in a fantastic setting in the Pattaya countryside, you get a magnificent sweeping view from the main pagoda. Photo above: A shot of the of the gardens at Three Kingdoms Park. Getting to Three Kingdoms Park Pattaya. Admission Fee at Three Kingdoms Park. Foreign (farang) Adult: 150 Baht. The Address of Three Kingdoms Park. Opening times at Three Kingdoms Park.